CW3E collaborator Nina Oakley published a paper with CW3E researchers Forest Cannon and Marty Ralph and National Weather Service meteorologists Eric Boldt and John Dumas. The paper examines the meteorological conditions that lead to wet years in the Lake Cachuma waterbasin. Lake Cachuma, a reservoir on the Santa Ynez River, provides water for over 280,000 residents and agricultural lands of Santa Barbara County, California. This area experiences high inter-annual precipitation variability, and is driven by the presence or absence of a few large precipitation events each year. We use daily precipitation observations from 1965 to 2017 to identify extreme precipitation events, defined as those exceeding the 90th percentile. We examine the role of these events, their associated synoptic patterns, and the El Niño Southern Oscillation (ENSO) in driving inter-annual precipitation variability in this basin. Results show that on average, a wet year features three or more extreme events, a normal year 1–2 events, and a dry year 0–1 events. We categorize extreme events based on distinctive large-scale circulation features and also find that 74% of events are associated with atmospheric rivers. El Niño years tend to have a greater number of extreme events, though this relationship is not dependable. The reliance on just a few extreme precipitation events and diversity among these events highlights the challenges of seasonal prediction and resource management in this area. This novel approach to defining variability on a watershed scale can support ecological, geological, and hydrological studies as well as regional water resource management. Figure Caption: Top panel shows contribution from ≥90th percentile events (orange portion of bars) and all other precipitation (blue bars) averaged across Santa Ynez River Basin Index stations for each season. The 90th percentile event count among the six stations for each season is given at the top of the bar. 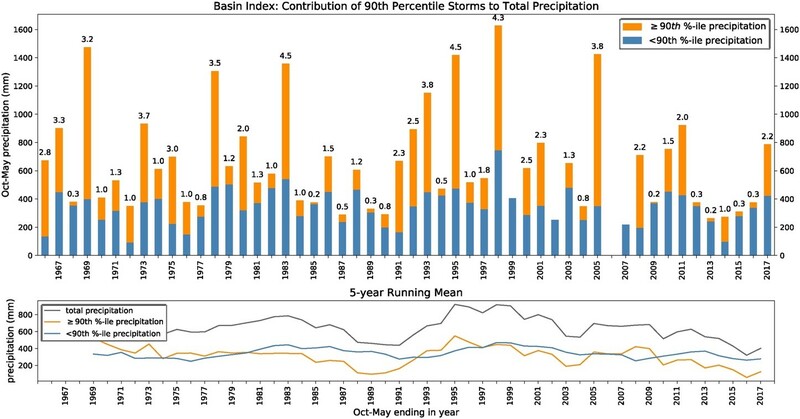 As storm count and contribution is averaged across the six Basin Index stations by season, fractional contributions and storm counts are present. The period of record mean precipitation is 648 mm. The mean contribution for non-extreme events is 343 mm and mean for extreme events is 305 mm. The bottom panel shows a 5-year running mean for total precipitation (black), precipitation from ≥90th percentile events (orange) and all other precipitation (blue). This demonstrates the dominant role of relatively infrequent extreme events on seasonal precipitation totals. *precipitation data in 2006 was missing from several stations. Oakley, N.S., F. Cannon, E. Boldt, J. Dumas, and F.M. Ralph, 2018: Origins and variability of extreme precipitation in the Santa Ynez River Basin of Southern California, Journal of Hydrology: Regional Studies., 19, 164-176, https://doi.org/10.1016/j.ejrh.2018.09.001.